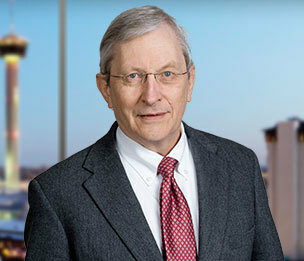 Personifying "knowledge, preparation, professionalism and integrity" (client quote, Best Law Firms 2018), David West has been a trusted advisor to financial institutions, trust departments, businesses, families and nonprofits for more than 30 years. He handles banking disputes involving the UCC, data privacy, check fraud, and officer and director liability; trust and probate litigation; and business disputes involving fiduciary liability, contracts, business torts, real estate and insurance issues. He has represented clients in approximately 50 jury and non-jury trials and arbitrations in federal and state court and counsels clients on internal policies and practices and litigation avoidance. David is Board Certified in Civil Trial Law by the Texas Board of Legal Specialization. UCC/Check Fraud/Data Privacy. Representation of banks in disputes involving check and account fraud, fraud involving remotely created checks, fraud involving wire transfers, check kites, elder fraud, protection of personal identifiable information and Uniform Commercial Code disputes. Lender Liability. Representation of banks in disputes with borrowers involving financial and loan structures, construction claims, fraud by third parties, and tortious interference. Officer/Director Liability. Defense of former board members of failed bank against claims asserted by FDIC for breach of fiduciary duty; counseling of board members regarding fiduciary obligations. Breach of Contract. Representation of banks in contract disputes with vendors, use of forged letters of administration to obtain estate funds. Protection of Personally Identifiable Information. Representation of health care provider in theft of personal identification information. Home Equity Lending. Representation of banks in suits to set aside/ enforce home equity loans. Counseling on Accounts. Counseling to banks, credit unions and investment brokers on powers of attorney, estates, trusts, guardianships and rights of fiduciaries to transact business on accounts and safe deposit boxes. Representation of fiduciaries and nonprofits in disputes involving determination of title to minerals, failure to reserve oil and gas interests in sale of real property. Representation of families in disputes involving estates, trusts, family limited partnerships, and limited liability corporations, and restructure of estate plans to resolve family disputes. Representation of nonprofit beneficiary in suit against executrix to recover estate assets, damages for self-dealing and breach of fiduciary. Representation of large church in multi-million dollar property dispute involving validity of trust clause in constitution of denomination; case involved neutral principals of law doctrine, First Amendment issues, charitable gifts, and injunction issues. Defense of trustee/beneficiary in claims over diversification and investment of assets in $22 million trust. Suits for declaratory judgment to construe wills and trusts and define the rights and interests of parties; suits to modify trusts to prevent adverse tax consequences and change corporate form of nonprofits. Partition Suits. Representation of families in suits to partition ranches, damages for breach of fiduciary duty by trustee. Will Contests. Representation of families in claims to remove executor, set aside will and recover real property and mineral interests. Guardianships. Defense of trustee against claims for loss of value of investment during temporary guardianship. Representation of nonprofit in temporary injunction action to stop construction of $200 million performing arts center. Defense of economic development corporation against claims of unauthorized use of public funds for construction of public park improvements. Defense of lignite mine owner in $22 million breach of contract claim. Easement. Disputes involving easements, rights of access to ranch property. Construction Disputes. Representation of home owners in suit to recover damages against builder of multi-million dollar home; defense of building contractor against claims by home-owners for breach of warranty, breach of contract, and DTPA violations. Manufacturing. Representation of window manufacturer for claims of breach of warranty for design and manufacture of windows. Membership Has It's Privileges: (And Duties), USLAW Fall Conference, Washington, D.C.
"Accessing and Protecting Digital Assets: Fiduciary Duties in a Digital World"
"Avoid Probate Court: Head to Your Bank Instead"
"Recovering Data Breach Losses from Non-Contractual Parties"